Where should we find innovation? I’d like to try and answer this question simply. I would suspect innovation would happen in a highly connected environment. Environments where ideas can spread quickly and easily. An example of this is when the Gutenberg printing press played a key part as an idea spreading catalyst during the renaissance. With this example I would think there would be a link between innovation and infrastructure. 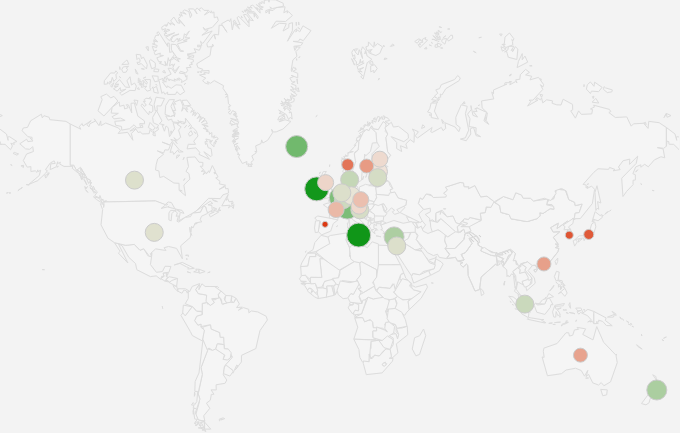 In the map above I have mapped these differences in the top 30 innovative countries. The countries which have a deep red bubble indicate they have a negative difference between their innovation score and their infrastructure score, while the countries which have a brighter green bubble indicate they have a small positive difference between their innovation score and their infrastructure score. To summarise, the deep reds have innovation scores well below their infrastructure, while the greens have higher innovation scores than their infrastructure. Should innovation be happening more in deep red countries? This is interesting. It suggests that the red countries have the infrastructure but they have no ideas to spread. In other words, these countries are just waiting for the right idea to arrive! But that bring up a new question. How do we know what idea these countries need?